Today for Tuesday’s Tools I talk about the tool I probably use second most to tweezers, my screwdrivers. 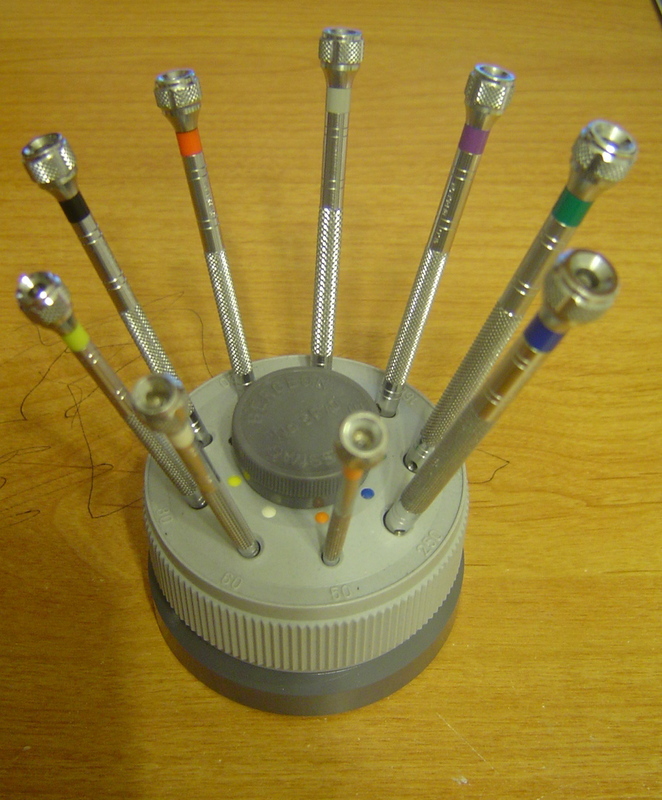 I use the standard 9 screwdriver set from Bergeon. There are better screwdrivers out there. I would really like a set with ball bearings instead of a friction bearing but I’ll probably wait until this set wears out before I break down and buy a new set. You really could get by with some pretty cheap screwdrivers as long as you have good blades. Screwdriver blades should be made from blued steel unless you are performing a delicate operation and you want to use something else. I have a few bronze blades that I use in extra delicate situations. New blades often look like the one on the left. 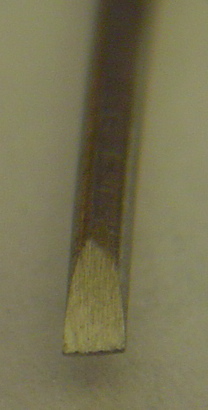 Notice that the grain runs parallel to the tip. This isn’t actually ideal but the shape of the blade is very nice. Notice the proportion of the flat of the tip and how the two sides are exactly parallel. 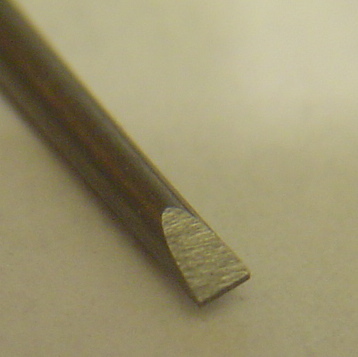 In everyday use screwdriver blades will wear and brake. Keeping them in good condition is a constant chore. I like the grain of my blade to run perpendicular to the tip because it keeps the blade from sliding as much. To prepare the tip I run the blade along my India stone making sure that the flat tip stays consistent in it’s width from one end to the other, if the tip is a triangle than the two sides aren’t parallel, if it is cigar shape than the two sides are rounded not flat. The screwdriver to the right has good proportions. When inserting the blade in the slot you want it to penetrate about 90% of the depth before contacting the corners of the slot. This gives you a nice strong grip and keeps it from sliding out. If it contacts the bottom of the slot it will slide easily. If it penetrates too shallow it will break off. Your screwdriver should be the same width (or slightly narrower) than the screw head you are turning. Not all slots are created equal! You may find yourself adjusting your screwdriver blades to make them more narrow or blunt depending on the width of the slot in the screw. This entry was written by J.Peter and posted on March 4, 2008 at 8:11 am and filed under Tuesday Tools, watchmaking. Bookmark the permalink. Follow any comments here with the RSS feed for this post. Post a comment or leave a trackback: Trackback URL.